You’re about to be the newest resident of Katy, Texas. Your to-do list feels a mile long: pack up your things, wash that last load of laundry, and try to not get lost driving to your new place. You’ve got a million things on your mind, and pouring over Yelp reviews of restaurants in Katy Texas isn’t your top priority. But you do still need to eat, so why not start by trying out some hometown classics? If you need a quick bite between unloading boxes or if you want to celebrate at happy hour after unpacking, there are restaurants in Katy for the occasion. Here are a few popular spots where you can take a break from the moving process and start your culinary right of passage to becoming a local. If you’re looking for a quick breakfast or a spot to discuss the morning paper with locals, Shipley Do-nuts is a must. This Houston-born doughnut shop has been around for more than 80 years and has multiple locations. Every morning, it serves fresh-out-the-oven varieties of traditional glazed, filled, and cake doughnuts. It also serves kolaches, a Czech-inspired pastry. Traditional kolaches have fruit or cheese filling, but the popular Texas adaptation is stuffed with sausage, jalapeños, or even BBQ brisket. Admittedly, we’re suckers for a good doughnut — along with most Katy residents. So when Hurts Donut recently opened its doors in our town, lines formed for days. Dining at Hurts is a fascinating experience. The apple fritters, kolaches, and cinnamon rolls are as big as your head. And the donuts themselves are works of art, with tons of flavors like Oreo Cheesecake, S’Mores, and PB&J. Be prepared for a sugar high that might last all day. A great way to start your day is at another one of our favorite spots in Katy — First Watch for breakfast, brunch, or lunch. 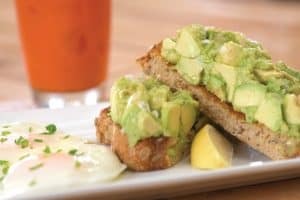 The hip cafe on Katy Freeway serves up delicious and fresh dishes like the elevated egg sandwich, made with gruyere cheese, smashed avocado, and cage-free eggs; or the decadent Tex-Mex inspired Chickichanga, which has whipped eggs, chicken breast, chorizo, green chiles, and avocado. If you haven’t tried proper Texas barbecue yet or you’re just on the hunt for your next favorite spot, Midway Barbecue is a longtime local favorite. Rather than grilling on an open flame, this place smokes its meat over pecan wood for a more distinct flavor. The brisket and chopped beef convert many first-timers into loyalists. Try it on a sandwich or order a combination plate with green beans, mac & cheese, or fried okra. Deep in the heart of Central Katy, in an obscure shopping center, lies a little gem called Joy Love Burger. This tiny establishment is home to perhaps the best burger in town. You’ll get a flavorful, Texas-sized patty on a homemade bun. A word to the wise: lines form quickly, so call in your order ahead of time. Local Table has something for everyone of all ages and palates. A few of their amazing menu options include Homemade Hummus served with toasted pita bread, the classic Cheeseburger Americana, a beyond delicious Gyro Plate, and staff favorite Mama’s Meatloaf. All cuisine is made from scratch and farm to table. And you won’t be disappointed by the innovative, family-friendly layout, either. On the hunt for a dining experience with fabulous ambiance? Look no further than Whiskey Cake, where the food and the atmosphere are equally enticing. The dining room is decidedly rustic-industrial, and handcrafted drinks flow freely from the stunning bar. All food is locally sourced and cooked from scratch. Do yourself a favor and order the famous whiskey cake for dessert — you won’t be sorry. When nothing will do but authentic Italian food, visit Antonia’s. The staff is friendly, and the food is reasonably priced. You’ll receive generous portions that are perfect for sharing or leftovers. Menu options include mouth-watering dishes like lobster ravioli, eggplant parmesan, and veal piccata. Peli Peli is a local favorite. The establishment gets its name from a rare spice native to Southern Africa, the birthplace of this award-winning cuisine. Chef Paul Friedman cooks up a fusion of spices and marinades influenced by Dutch, Portuguese, and Asian fare. On top of the fabulous food, the atmosphere is stunning and romantic. Tacos are a cult favorite of Texas cuisine. One of the most popular vendors is Torchy’s Tacos. Its tagline is “Damn good tacos,” and its diehard fans agree. For breakfast, you can stuff a warm tortilla with your choice of scrambled eggs, cheese, bacon, potatoes, beans, spicy chorizo, and salsa. Torchy’s serves breakfast all day and has heartier lunch tacos, too. For later in the day, two of the most popular tacos are “The Democrat,” with shredded beef barbacoa, and the “Trailer Park,” with fried chicken smothered in green chile and poblano sauce. Of course, no Torchy’s experience is complete without a side of green chile queso and chips. Another great taco comes from Rudy’s Country Store and Bar-B-Q. While barbecue in a breakfast taco may sound strange, it’s actually one of the best things this side of heaven. But you’ll also find the usual suspects like sausage and potato. The lunch and dinner menu consists of barbecue and all the fixings. Try the legendary barbecue with some juicy sausage, and finish it off with sides like Rudy’s famous creamed corn and homestyle potato salad. If you have some time to spare, take a look at the unique gift shop. You can take home Rudy’s famous rubs and sauces, apparel, and more. For a more upscale but casual experience, head over to Black Walnut Cafe. There, you can enjoy breakfast items all day from their cooked-to-order menu. May we suggest the Challah French Toast? It’s thick and tender with a crispy crust, covered in lemon zest, whipped honey butter, maple syrup, and a final dusting of powdered sugar. And the coffee is hot and fresh all day. Not in the mood for breakfast? The menu is extensive, and must-try dishes include the Darn Good Burger, Seared Ahi Tuna Salad, and Black Walnut Lemon Chicken. The delicious marriage of Mexican and Texas flavors, Tex-Mex, is the backbone of many restaurants in the Lone Star state. Chuy’s is a Tex-Mex institution, popular across Texas and beyond. It’s popular for “Big As Yo’ Face” burritos, green chile-smothered chicken enchiladas, and of course, frozen margaritas. Happy hour is from 4-7 PM every weekday, and it includes a complimentary nacho bar of chips, salsa, and queso dip. While away a late afternoon at The Cellar Door, Katy’s most popular wine bar. From 3-7 p.m. Tuesdays through Fridays — and all day on Mondays — you can sip your favorite beverage at a deep discount. Additionally, all bottles are 30% off on Wednesdays. The establishment also serves a full gourmet menu and offers seating in their lounge area, tasting room, or dining room. When it comes to Happy Hour, the Irish do it right. Every Monday through Friday from 3-6 p.m., Mo’s Irish Pub serves 22 of their most popular pints for just $2.22 each. And the food is to die for — menu items include their Classic French Dip Sandwich, zesty Southwestern Shrimp Chopped Salad, and a heavenly Mo’s Shepherd’s Pie. Try something off the Jameson Grill, where sauces, glazes, and marinades derive their flavor from the famous Jameson Whiskey. What put this place on the map is the chimichanga. For Mexican food newbies, that’s a fried burrito. Jimmy Changas is also popular for inventive seafood alternatives such as shrimp and crawfish enchiladas. Looking for authentic Mexican street food? Tacos from Las Tarascas are your answer. This deli-style counter inside a grocery store is the real deal. This place prides itself on serving California-style burritos. Weekday plate specials of carnitas, guisada, fajitas, or their infamous burritos are available for around $8. If you are considering Katy for your next move and find yourself looking for a local mover to safely handle your move, look no further than Ameritex Katy Movers. You can fill out the quote form above to get your free quote today.